Stage 1 of the Ōtaki College 21kw solar energy installation has gone live. With support funding from Pub Charity, Kāpiti Coast District ­Council and Ōtaki Community Board, the XŌtaki Foundation Trust has commissioned and had installed the first stage 10.4 Kw system. When completed it will be the second largest school solar system in New Zealand. The Trust, set up in 2014 by past College pupils to support the College development, is the owner of the solar system and will provide the energy produced to the College at a rate similar to that charged by commercial companies. It will use the revenue received to fund scholarships and projects for school pupils. 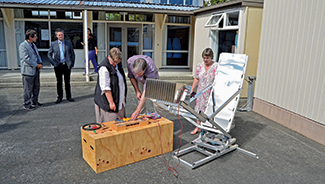 The project has been a wonderful collaboration between the College, the Trust, Energise Ōtaki clean technology businesses in Ōtaki, and funders. This will provide us with an on-going source of revenue that can only grow as energy prices inevitably increase. The benefits for our young people will be huge. I would like to warmly invite whanau and community to this event – 2.00pm on April 2nd in the College Hall. It is at this Assembly that we celebrate the final 2014 results of our students in their NCEA courses. A team of 11 year 7&8 students ­attended this event. Fallon Roy won Year 7 Girls, Damien Doyle Year 8 Boys, and Kees Sims and Tiana Housiaux-Roderique won 1st Mixed Team. Ocean Athletes – Over 800 athletes from all over New Zealand attended these Championships. Daisy Davis won two silver medals in swimming events while Damien Doyle achieved two 5th’s and two 7th places. A small team represented the College at this event coming 3rd overall. 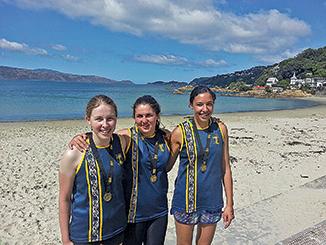 8 students attended this championship in the build up for the NZ Triathlon Championships in Taupo – the Otaki College U16 girls team of Cassie Lundie, Lucy Fleming and Kahurangi Sturmey won gold. A College team of junior swimmers have competed at the Ōtaki and Kapiti Inter-schools – swimmers of the meets were Fallon Roy and Damien Doyle. Rugby 7 — The combined Rahui U15 team competed at Playford Park last Wednesday coming 3rd overall. Touch — College sent a mixed team to College Sport Wellington’s senior qualifier. The team played well. Waka Ama — Competed well in Wellington going into their National Secondary Schools competition at the end of March. Canoe Polo – The recently formed Junior Girls Team represented the College with pride at the recent Canoe Polo Regionals at Horowhenua College. The Team received a wild card entry to the upcoming Secondary School Canoe Polo Championships to be held in Fielding. Weekly Sports — A large number of students are involved in weekly College Sport competitions including Cricket, Volleyball, and Tennis. 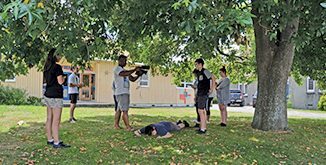 The short film workshops were facilitated by Māori filmmakers and were held at Hadfield Hall on the 23rd and 24th February. The aim of the workshops was to assist those tauira aged 11–17 years with a real interest in making films to do just that! Make a film and have it screened at Māoriland Film Festival 2015. On Thursday 26 February, the Year 7/8 students of Ōtaki College were visited by well known Australian kite maker, Tony Rice. Over the course of the day, Tony worked with all of the Year 7/8 students and teachers to create some fantastic bird kites. These workshops were productive and enjoyable and at the end of each session, it was fantastic to see the student’s kites flying high! A number of our students also took their kites to the Kite Festival on the weekend. The students would like to thank Tony for coming to work with us, the Ōtaki Kite Festival organisers and the Kapiti Coast District Council Creative Communities Grants Committee for their support in making this happen. We look forward to welcoming Tony back to Ōtaki College in 2016 for some more awesome kite making workshops. 5 Year 11 drama students have won a scholarship worth $1,000 each to attend a Professional Level – Teen Acting for Stage and Screen course in Wellington during the April ­holidays. This course is run by Miranda ­Harcourt and is taught by nationally renowned tutors in the film industry. The students are: Megan Carson, Cameron La Frentz, Rebecca Neill, Ele Warwick and Renee Winton. Last year these scholarships were won by Turama Baker-O’Connor, Kaya Edginton, Keegan Hargraves-Raika, Monique Tawharu and Grace Teu. 8 Year 12 & 13 drama students have won a scholarship worth $200 each (plus $100 each from STARS) to attend a week long “school” with internationally renown tutors at the National Youth Drama School during the holidays. They will be travelling to Napier for this – the first time ŌC will participate in this fantastic course.